Thomas Baptiste Morello (born May 30, 1964) is an American guitarist best known for his tenure with the bands Rage Against the Machine, Audioslave, his acoustic solo act The Nightwatchman, and his newest group, Street Sweeper Social Club. Morello is also the co-founder (along with Serj Tankian) of the non-profit political activist organization Axis of Justice, which airs a monthly program on Pacifica Radio station KPFK (90.7 FM) in Los Angeles. Born in Harlem, New York and raised in Libertyville, Illinois, Morello became interested in music and politics while in high school. He attended Harvard University and earned a Bachelor of Arts degree in Social Studies. After his previous band Lock Up disbanded, Morello met Zack de la Rocha and the two founded Rage Against the Machine together. The group went on to become one of the most popular and influential rock acts of the 1990s. He is best known for his unique and creative guitar playing style, which incorporates feedback noise, unconventional picking and tapping as well as heavy use of guitar effects. 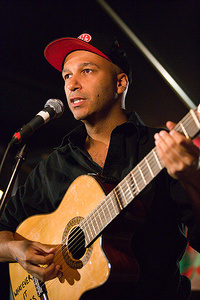 Morello is also noted for his leftist political views and activism; his creation of his side project The Nightwatchman offered an outlet for his views while playing apolitical music with Audioslave. He was ranked number 40 in Rolling Stone magazine's list of the "100 Greatest Guitarists of All Time". This webpage uses material from the Wikipedia article "Tom_Morello" and is licensed under the GNU Free Documentation License. Reality TV World is not responsible for any errors or omissions the Wikipedia article may contain.